Has St. Francis ever been to Cyprus? Most probably yes, on his voyage to the Middle East. On the 24th of June 1219, Francis of Assisi set sail from Ancona, Italy, and voyaged until Acre, northern town of Palestine and then to Damietta, Egypt. Ships then, especially on the Mediterranean Sea, were mostly coast vessels. From Ancona then to reach the coast of Palestine a ship would touch at ports along the coasts of Italy, Greece around the Peloponnese, Crete, the Cyclades islands, the coast of Anatolia, maybe the island of Rhodes, Cyprus and finally the coastal town of Acre (St. Jean d'Acre; today Akko). Things being as they may, St. Francis came to Cyprus, for some days, and saw this beautiful island. In our church at Kyrenia there is a small carved marble which represents St. Francis and some of his brothers disembarking at the harbour. One thing is certain that the Franciscans were on Cyprus on the year 1226, when St. Francis was still alive. 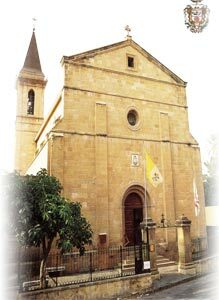 They had friaries and churches in several places until the year 1571, when the island fell into the hands of the Turks. On that year they fled away with all the other Orders (Dominican, Agustinians, Cistercians, etc). In 1592 they came back. We know that they established themselves on the same spot where we are now. In the year 1642 they built here the first church dedicated to the Holy Cross, which functioned until the end of the 19th century. On April 8th, 1900, the first stone of the present church was blessed and laid. In order to build this church the previous one was unfortunately destroyed. The expenses for the building were partly shouldered by the Royal Family of Spain and partly raised by the Friars. On February 16th, 1902 the church was inaugurated. The Friary beside the church was rebuilt in 1959. The documents tells us that before the present Church there was another one, with the same title, but very small and maybe not in a good condition; that the expenses for the new church were met by the Franciscans Father with the sinnificant help of the Royal House of Spain, who was, at that time, the protector of the Franciscan Friars in the Middle East in front of the Sublime Porte, that is the Sultan of Constantinople. The presence of Spain in our Curc is still alive: in fact the firest of the ovals depicted in the centre of the vault represents the coat of arms of the Royal House of Spain. The same design is also present in several of the old liturgical vestments that are kept in our sacristy. Futhermore, the statues of St Francis, St Anthony and the Virgin Mary, and several other liturgical objects, donated by Spain, remind us of the interest and generosity of that country for our Church until the year 1972, the superior of the Holy Cross Friary ha to be a Spanish Father, as a privilage to remember the protection offered by Spain. On April 8th, 1900 the first stone of the present Church was blessed and laid. The old Church unfortunately was completely destroyed; we do not have any document of how it was. The new Church was inaugurated on February 16th, 1902. The Friary besice it was rebuilt in 1959.